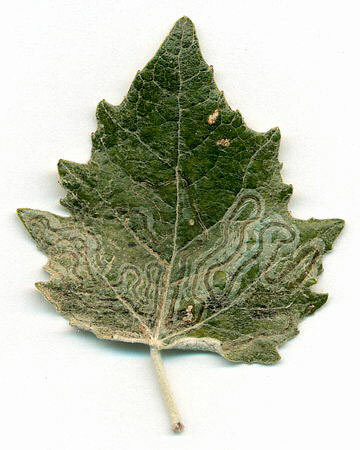 Mines that are visible only at the upper or lower surface of a leaf are, exceptions apart, either tentiform mines, or mines made by larvae of the fly family Agromyzidae. 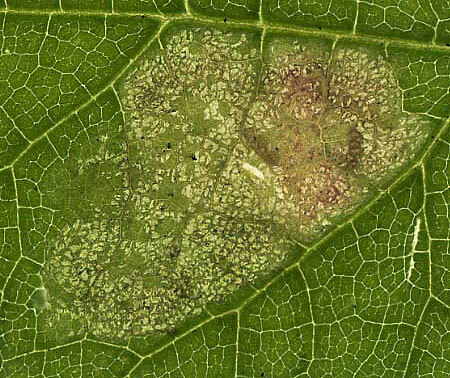 In upper-surface mines the palissade parenchyma has been eaten away. Because of the whitish upperside they are easy to find. 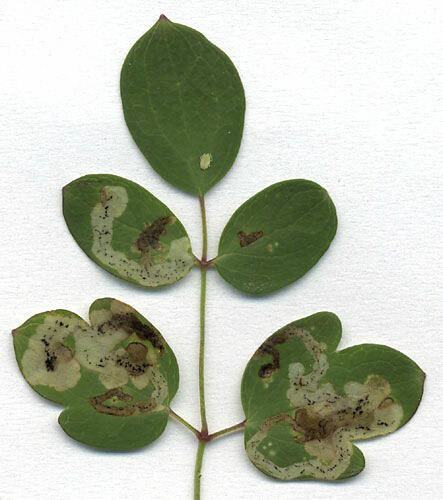 Under-surface mines, in which only the the sponge parenchyma is eaten away, are less easy to find, especially when the lower surface of the leaf is hairy. This type is much rarer than upper-surface mines – possilby because the sponge parenchyma is less nutritious than the palissade parenchyma. An odd agromyzid species starts by making an upper-surface mine, to continue it at the lower surface. 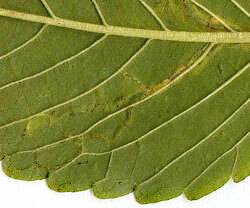 Many more species start at the leaf under side, and continue with an upper-surface mine. Generally the lower-side part of the mine is a very shallow corridor, quite difficult to observe (the more so in herbarium material). 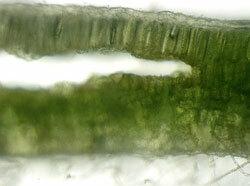 In a few species the mine is made on the interface of palissade and sponge parenchyma, which gives this type of mine a characteristic yellow-green appearance. They are called interparenchymatous mines. Another rare type of agromyzid mines. It concerns an interparenchymatous mine, from which numerous holes are eaten in the “roof”, i.e. the palissade parenchyma. When hold against the light the mines looks riddled. In the field the mine looks most like a patch diseased by some fungus. 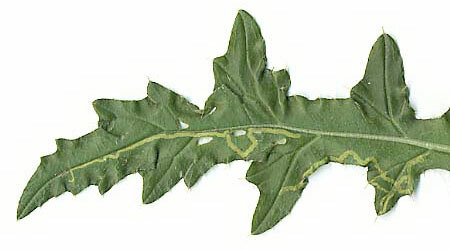 Larvae of the moth genus Phyllocnistis make long corridor mines, entirely in the epidermis of the leaf (sometimes also of the petiole and bark of young twigs). The epidermis is colourless (contains no chlorplasts) and the rather broad, silvery corridors strongly resemble snail trails. 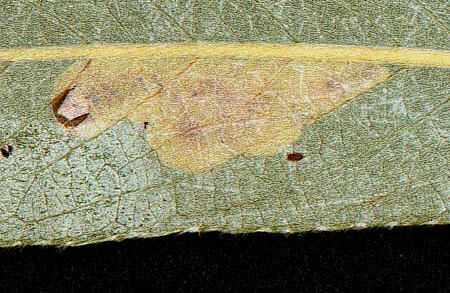 Phyllocnistis-larvae drink, rather than feed, on cell sap; this makes the frass almost invisible, a dark, ill-defined continuous line at most. The genus Phyllocnistis belongs to the family Gracillariidae. In other genera of this family the larvae also begin their life as cell sap drinkers in an epidermal corridor, but after some moults they switch to the consumption of parenchyma, and the formation of a tentiform mine.